In this post I am presenting a couple of things I’ve learned from the analysis of a problem, that manifested itself in an occasional HTTP 500 errors in production instance of an ASP.NET application. This time I don’t aim at exhaustively explaining every single point, because each of them could be a subject of a dedicated blog post. The story begins with SQL error: SQLEXCEPTION: Transaction was deadlocked on lock resources with another process and has been chosen as the deadlock victim. In any reasonably modern version of SQL Server Management Studio there is an XEvent session system_health under Management → Extended Events. 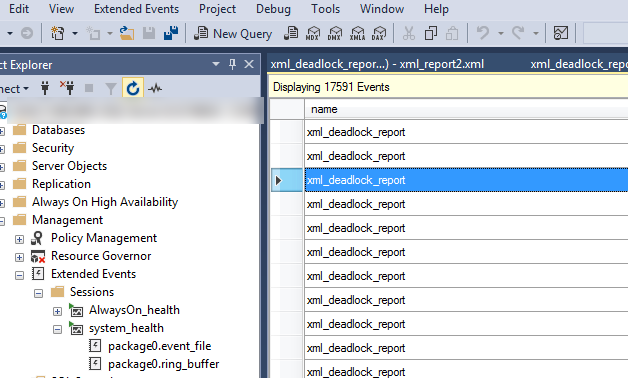 It allows for viewing some important server logs, among which xml_deadlock_report in particularly interesting. It is very important to have an access to the production instance of database server in order to be able to watch the logs. In this particular case, these xml_deadlock_reports contained one suspicious attribute: isolationlevel = Serializable (4) and the SQL code was a SELECT. I would not expect my SELECTs running with Serializable isolation level. The isolation level is an attribute of a connection between a client and the database server. A connection is called session in SQL Server terminology. An explicit BEGIN TRAN is not necessary for the isolation level to be applied. Every SQL statement runs in its own statement-wide transaction. However, for such narrow-scoped transactions, in practice it may not make any difference whether you raise the isolation level or not. The difference can be observed when a transaction is explicit and spans multiple SQL statements. The cause of setting the serialization level to Serializable was the behaviour of the TransactionScope . If you use it, it raises the isolation level. It is just a peculiarity of this very API of the .NET framework. It is good to know this. SQL Server, at last in 2012 and some (I am not sure exactly which ones) later versions, does not reset the isolation level when ADO.NET disposes of a connection. A connection returns back to the connection pool  and is reused by subsequent SqlConnection objects unless they have different connection string. The connection pool size, if the connection pooling is active, poses the limit of how many concurrent connections to a database server a .NET application can make. If there are no free connections in the pool, an exception is thrown . Eliminating the usage of TransactionScope did not solve the issue. Even if you run SELECTs under the default Read Committed isolation level, these still issues Shared locks which may deadlock with Exclusive locks of UPDATEs. In any reasonably high production data traffic, where SELECTs span multiple tables, which are also very frequently updated, it is highly probable, that a deadlock will occur. The difference between running SELECT under Serializable isolation level and Read Committed level is that in the former, the locks are kept from the moment of executing the SELECT until the transaction ends. You can observe it by manually beginning a Serializable transaction, running any SELECT and observing dm_tran_locks DMV and only then committing (or rolling back, whatever) the transaction. With Read Committed level locks are not kept until an explicit transaction ends, they are released immediately after execution of a SELECT finishes. These are the same kind of locks, Shared locks. This implies one cannot observe the difference between executing a SELECT under Serializable and Read Committed, when there is no explicit transaction and thus, there is only a statement-wide transaction which releases locks immediately after the results are returned. Setting isolation level of Read Uncommitted is practically equivalent to running a SELECT WITH(NOLOCK) hint, even if you don’t explicitly open a transaction. In Entity Framework a SqlConnection is opened for every materialization of the query, the results are returned, and the connection is immediately closed and returned back to the pool . The connection lifetime is by no means related to the scope of DbContext object. I can see a kind of similarity between how Entity Framework uses SqlConnections and how ASP.NET makes use of threads when executing async methods. A thread is released on every await and can be used for doing something more valuable than waiting. Similarly, a SqlConnection is released right after materialization and can be used for executing different command, in different request (in case of ASP.NET) even before DbContext is disposed of. It is not that obvious how to reset the isolation level of the connection. You see, every time your C# code using Entity Framework results in sending a SQL to the SQL Server, it can take different connection from the pool (if anyone knows if there is any ordering applied when retrieving connections from the pool, please feel free to comment). It may or may not be the same connection you used previously. Consequently, it is not easy to ‘catch’ the underlying connection using Entity Framework. You can call BeginTransaction every time you use DbContext, and then you are guaranteed to own the connection for all your SQL commands. But that way you are forcing opening transaction when you don’t really need one. What I recommend is to handle StateChange event of DbConnection object as described in . You can do it either on opening the connection or on closing it. I work with a quite big enterprise system in my job. Not surprisingly, it uses Entity Framework (Core, but it does not matter) and SQL Server. The system consists of multiple reusable components also in the data access layer. I had to modify DbContext and write some flexible and reusable method accepting a predicate as an argument and apply the predicate on a DbContext. Let’s assume we are using the table A from the previous post. I happily coded the signature of the method to use Func. Let’s simulate this in the LINQPad and run our Func against a DbContext. It did not work. Or… did it? The picture above shows only generated SQL, but I promise the results show correctly the one record. The problem is, the predicate has been applied in memory after having pulled all the records from table A into memory as well. I am not going to explain what it means for any reasonably sized system. 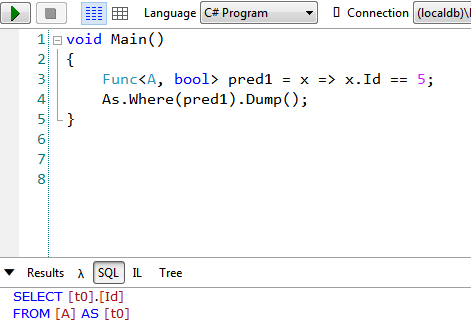 The correct way of doing this is to use Expression<Func<A, bool>>. The explanation is in fact really obvious for anyone deeply understanding how ORMs work. The data structure which allows for inspecting a predicate on the fly and building final SQL query is Expression. There is already an infrastructure for so-called expression visitors. 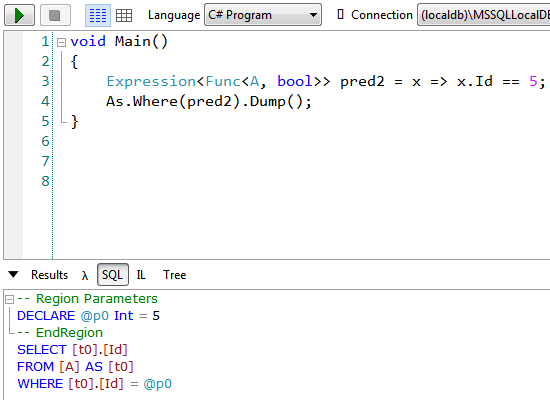 Please also note, that you can always get your Func from Expression<Func> by calling Compile method on it. I am implementing the domain with the following SQL. I omit foreign key constraints for brevity. It is very easy to understand, that WHERE is applied to filter all the results, no matter what my intention for JOIN was. When a record is LEFT JOINed, the condition is not met, because values from B are null. But I still need to have A record in my results. Thus, what I have to do is to include my condition in JOIN. It is also very easy to fall into this trap of thoughtlessly writing all intended conditions in the WHERE clause. I’ve been working with .NET core recently and I’d like to post some random observations on this subject for the future reference. It is possible to create Nuget package upon build. This option is actually available also from the VS2017 Project properties GUI. Add this code to csproj. There is a reference documentation for the available targets: here. dotnet run is used to build and run from the directory where csproj resides. It is not a good idea to run the app’s dll directly. Settings file can be missing from bin folder and/or launch profile may not be present there. I know everyone uses Cmder, but it didn’t work for me. It hung a few times, it has way too many options, it has issues sending signal to kill a process. I gave up on using it. I work with carefully configured default Windows console and believe it or not, it serves the purpose. I also know you can use Windows Subsystem For Linux under Windows 10, which is truly amazing, but I am just talking about the cases where you need standard Git for Windows installation. When I worked with Unix I liked GNU Screen, which is terminal multiplexer. It gives you a bunch of keyboard shortcuts to create separate shell processes under the same terminal window. The problem is, it is not available under GIT Bash. But it turns out, its alternative — Tmux is. This is everything you need to know to start using it. Simple. There are many other options which you can explore yourself, for example here http://hyperpolyglot.org/multiplexers.